It’s been our tradition to start looking for an appropriate “learn to drive” vehicle toward the end of the 14th year, so that the initial driving lessons can occur on the vehicle that the teen in question will be driving. 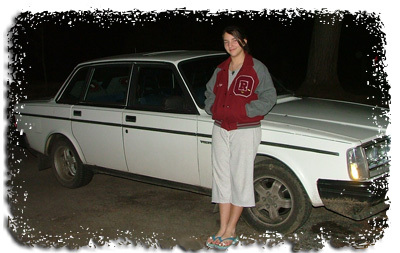 When I heard that the Tumormobile might become available for purchase, Hubby and I were in complete agreement that an older Volvo sounds like the perfect teenager car. Status and refinement to make her happy, but lots of metal and an outstanding safety record for our peace of mind. Tonight, we traded paper and ink to bring home what will be Gamma’s vehicle. She’ll get her learner’s permit in the early summer, and this is what she’ll learn on. Since I drove it home, I can attest that it’s just perfect. And she loves it. 5 comments Monday 12 Feb 2007 | Netmom | Etc. I think that is great. The Tumormobile has found a good home. I can’t think of anyone better deserving of the Tumormobile than Gamma. I just can’t believe she is close to driving. I can still see her sitting in her high chair with only a diaper on. Man am I feeling old today.